This apartment for exclusive use is ideal for 5 guests, offers two beautiful bedrooms, a furnished terrace and free Wi-Fi. The apartment has two comfortable bedrooms with separate private bathrooms. The living room is perfect for relaxing after a day at the beach: rest on the comfortable sofa and enjoy a good book. The kitchen is super equipped, Enjoy the panoramic view of the city and the sea from the balcony. 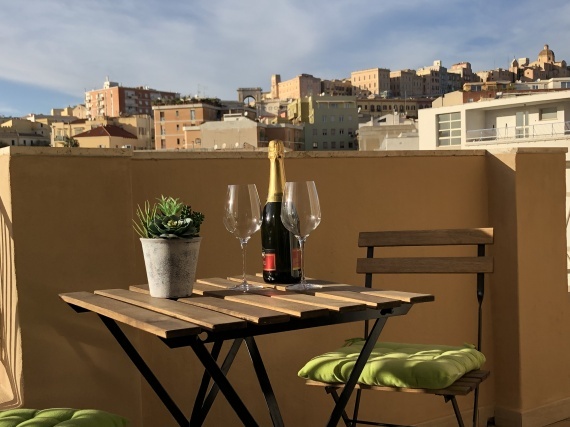 The house is a short distance from the port, the center of Cagliari and the main sights: the Basilica of Bonaria, the Basilica of San Saturnino, the Bastion of Saint Remy, the Elephant Tower, the Roman Amphitheater, the Archaeological Museum , lots of shops and exclusive restaurants that animate the Cagliari nightlife. We recommend a visit to the Regional Natural Park of Molentargius-Saline, where you can admire the beautiful pink flamingos, and the Poetto beach.